Our lovely farmhouse is a wonderful place to lie back and take it slow. It is a special property that is designated one of East Quogue's historic landmarks - in fact, the first post box in the United States was erected in 1787 right around the corner. The property has been completely and lovingly renovated with modern amenities and systems, and is extremely comfortable and very well-appointed, inside and out. The wraparound porch hosts several sitting areas as well as a shaded dining table and an outdoor fireplace. The back deck has another dining table and a gas grill immediately adjacent. The garden has lots of lilacs, lilies, ornamental grasses, and hydrangea, and the backyard is completely fenced and sports a 16' x 32' heated pool - there's a removable security fence to separate the pool from the backyard if desired. Inside, there's a large living room with a 55" 4K HD TV over the fireplace and french doors to the porch, and a fully stocked, spacious country kitchen which opens to a large dining/sitting room with wraparound windows and a french door to the porch. Upstairs, there's a large and lovely master bedroom with another 55' 4K HD TV, en suite bathroom, walk-in closet, plus two bedrooms and another full bathroom. There's lots of room to gather and entertain, as well as plenty of places to find solitude if that's what you crave. Read, swim, eat, bask in the sun, watch the grass grow, take a nap. For a little adventure, take a short walk into town to the gourmet deli or the fine wine shop, or the cafe or the pub, or the local farm stand for fresh baked goods and fruits and vegetables right off the vine. Or visit the bait & tackle and stroll down to the bay to fish, or feed the ducks, or count the clouds. Or hop on a bike or in the car and take a short drive (8 minutes!!) to the gorgeous dunes at one of the world's most beautiful beaches. If it's culture you crave, don't miss the local galleries, vineyards, and world-class shopping. And don't worry about anything – our property manager is available 24/7 if you have any questions at all or should something need attention. A tidbit more: many of our guests use the Guest Cottage for extra friends, relatives, or child care. It is steps away just at the end of the driveway with its own deck, full kitchen and full bath. It makes it very easy to be together when you want to, and not when you don't. Here is a picture of us at the beach in East Quogue! We bought the house when living in NYC and needed an easy escape without the traffic and crowds that are found further out east. East Quogue is a small town and feels that way but is an easy drive to all the things we like to do when we actually leave the house! 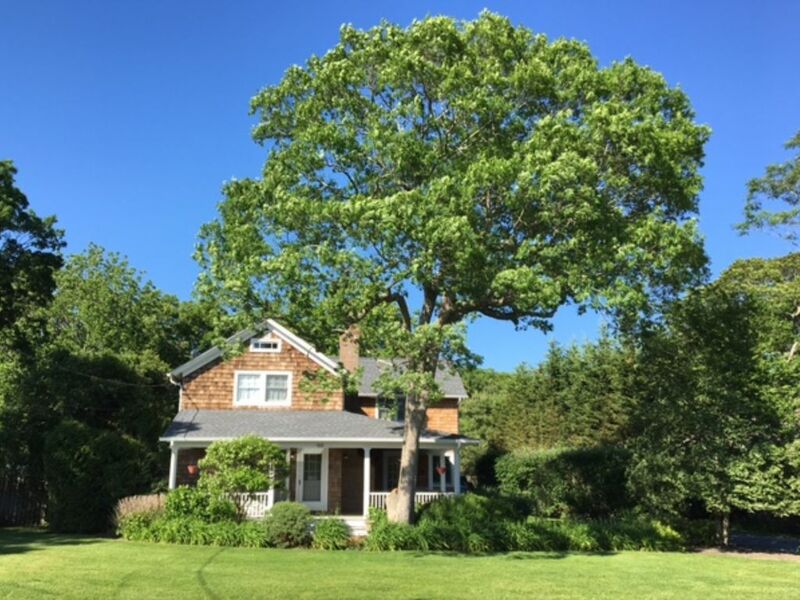 We are bi-coastal and travel a lot - our house in East Quogue is truly the most relaxing place we know. We usually sit on the porch, swim, read, sleep, and eat too much. When we are feeling ambitious, we walk into town or down to the town dock on the Bay, or go to the Beach. And when we crave a bit of excitement, it's easy to go to the other parts of the Hamptons that are more 'happening'. But usually our ambitions fail us, and we just veg out and watch the grass grow! Close to Ocean Beaches - 8 min drive to Tiana Beach, 12 min drive to Ponquogue Beach - both with bathrooms & concessions. 4 min walk to town center (village green, restaurants, great gourmet deli, pub, wine/sweets/bagel/antique shops). 8 min walk to Shinnecock Bay. Short drive to Nature Preserve/Wildlife Refuge. Bluetooth Enabled Basic Cable + IHeart Radio, Netflix, Amazon, Showtime, YouTube, etc. Sizable Front and Back Lawns, Large Trees, Lilacs, Hydrangeas, Ornamental Grasses, Lilies, Perennials, Dogwoods, and more. Back Deck on House. Front Deck on Cottage. 16x32 heated pool with full deep end and sunning steps in shallow end. Pool is in fenced backyard and can be additionally separated by childproof fence if needed. Experienced Property Manager keeps everything immaculate and in impeccable order. She is on hand 24/7 if anything is needed. Property is fully & regularly serviced. This house has it all! It's a charming house on a quiet street and just a 5 minute walk to town. Our family including adult children loved our stay. It has great places to "hang out", including a wrap around porch, a great room attached to the kitchen and a fenced in back yard with a pool. The house is so nicely appointed and comfortable and meticulously maintained. Couldn't recommend it more highly! We stayed at the house for the month of July and had a fabulous time. Everything we needed was there, the grounds were immaculate, the pool was great, the grandfather pool house was fantastic and the services were top rate. Transportation was a snap (don't take that for granted in the Hamptons!) and house was quiet. Walking distance to free concerts and a 10 minute drive to the beach or Westhampton. Great restaurants are close. If you're into biking, it doesn't get much better as a location: 20 minutes from Hampton Bays, 20 minutes from Westhampton. A tremendous experience. We loved it. The house was immaculate and decorated in a charming style, and located on a quite secluded street with a beautiful heated pool in the backyard. Also, within driving distance of South, East, and West Hampton each of which is filled with beaches, shops and restaurants. The house felt like a home as soon as we arrived. This June we rented the farmhouse for the second time around because we loved the property so much! The home is just far enough from the city to feel like you've really gotten away, but is only a 2 hour train ride. The farmhouse is so charming and comfortable, with lots of great outdoor space for relaxing. We especially loved the great big front porch for a dining, relaxing, and sitting by the fire on a chilly evening. The backyard is also spacious and fenced in, great for our pup. Would definitely recommend! When booking this rental I did not know what to expect. The house turned out to be amazing. A friend and I were the first people to rent out the house after renovations have been done. Everything from the décor, to the amenities, to the location were perfect. The owner, Alison was not lying when she said it was a little slice of heaven on Earth. I have to say the best part about the house are the beds, they are so comfortable that you never want to leave. Truly-'A Home Away From Home'. Throughout the years I've spent many long weekends at this charming old farmhouse and it never disappoints. This cozy home truly is a home away from home. The owner, Alison, is great. She's extremely helpful and always makes me feel that she is completely dedicated to my time at the house being pleasant and relaxing. Over the past several years this cozy home has had some updates and each one was a wonderful surprise. The porch addition, which includes an impressive outdoor fireplace, was a breathtaking surprise. This is now my favorite place to sit with a book or unwind in the evening with friends. Then came the beautiful pool, which really completes the back garden. Perfectly situated to allow for full sun all day and it's heated too! It's a lovely oasis complete with lounge chairs and umbrellas for shade making it an easy spot to waste the afternoon away. However, this year's update was the largest. The house had a huge renovation which allowed for the addition of a tremendous master suite. This space is larger then my NYC apartment! Complete with a beautiful en-suite, large walkin closet and soaring ceiling. Under this space is the enlarged kitchen. Which now boast a dining area that is home to a large country style table that seats 8 and is topped off with a fun farmhouse chandelier. Just behind this is a cozy conversation area/family room with a French-door that opens to the outdoor fireplace. The renovation adds to the existing charm of this old farmhouse and comes along with a completely new climate control system. In addition to this, the cottage out back has been repainted in this brilliant barn-red, which really adds to the farmhouse feel. Mr. Milo (my Victorian Bully) and I had a wonderful relaxing weekend. We cannot wait for our next visit. Thank you Alison, for all the wonderful memories. Weekly Rates include Utilities except Pool Gas. Utilities are not included in monthly rates. Cleaning Fee: $350 for House - Additional $50 for Cottage. Security Deposit: $2,500 (fully refundable if no damages). Pet Fees: $25/night/pet plus Additional $50 cleaning fee + Additional $250 security deposit. In the event of Cancellation, we will will make every effort to rebook your time and will refund in full whatever monies we are able to recoup. Immediately upon Cancellation, we will immediately refund your Security Deposit & Cleaning Fee.